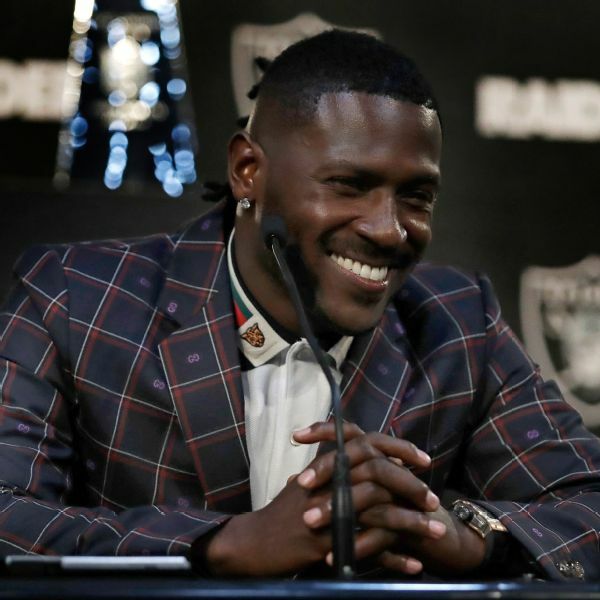 ALAMEDA, Calif. -- Saying his ultimate goal is to pass Jerry Rice as the NFL's all-time leading receiver, a mellow Antonio Brown also talked about bringing a higher level of accountability to his teammates while being praised for his legendary on-field work ethic during his introductory news conference as the newest member of the Oakland Raiders on Wednesday. "Mr. Gruden played everything in my decision coming here," Brown said at the team facility. "Obviously, he's an offensive guru. You get excited just talking with him. He's got so much knowledge of the game. He's coached some of the greatest players ever, so he knows what it takes. "He did his homework on me. He done seen every play I've played in. ... He doesn't want to talk about what you're doing well; he always wants to focus on the things that you can even do that much more better. When you have a coach like that, it's like your dad -- you want to be around because you know he's not going to build you up for what you're doing [well], he's going to encourage you on how you always can be better." Gone was the gold-dyed mustache; he said he wanted to be more "professional." There were no histrionics in his arrival -- no helicopter landing or Facebook Live stream -- even if the news conference did start about 25 minutes late. Brown and his family, with agent Drew Rosenhaus, walked into the team auditorium with Gruden and new Raiders general manager Mike Mayock a few minutes after the trade was made official in a news release -- Brown to the Raiders for Oakland's third- and fifth-round draft picks this year, Nos. 66 and 141 overall -- announcing the deal that was struck Saturday night. "He is as good of a practice football player and works as hard as any football player I have ever seen in my life," Mayock said of Brown. And this from Gruden: "We don't want to have a good receiving corps; I want to have the best receiving corps in football. And I think to have the best, you've got to have the best; and in my opinion, we acquired the best wide receiver in football. And let's get to work. "He's done everything in his power to be the best he can possibly be, on and off the field. His body of work is not only impressive, it's fun to watch. He's electrifying after the catch, he's a great competitor, he wins the 50/50 ball, he's outstanding in short areas. You have a great imagination as a football coach when you coach a man like this. He can play split end, he can play flank or he can play in the slot. He can return punts and sell popcorn at halftime. We're excited about this guy." Gruden said he and Mayock, along with their wives, Cindy and Mandy, were in Las Vegas on Friday night to attend an event with Raiders owner Mark Davis. "Instead of having a nice date, a double date, we dated Rosenhaus and Antonio Brown," Gruden said with a laugh. "Never saw our wives, but it's as happy as Cindy and Mandy have been since we've known them." Gruden and Mayock are just as thrilled with Brown reinvigorating the Raiders' offense (Oakland also agreed to terms with former Chargers receiver Tyrell Williams on Wednesday). Brown and Rosenhaus renegotiated the three years remaining on his contract so that they are worth $50.125 million, with incentives that can increase the value to $54.125 million, and $30.125 million guaranteed. Brown has averaged 114 catches for 1,524 yards the past six seasons. No Raiders receiver in franchise history has ever reached either of those marks in a single season. Since 2014, Brown's 576 receptions are 52 more than any other player in the NFL. His 59 receiving touchdowns are 14 more than anyone else, and his 2,204 receiving yards and 21 TDs in the fourth quarter are both NFL highs. Jordy Nelson led Oakland's receivers with 63 catches for 739 yards and three touchdowns last season. "My plan is to get around here, get in the room, start holding guys accountable, let them know it's a certain type of standard here now that we got to uphold," Brown said. "Receivers, we need an accountability system -- drops, [being] late, fines, missed routes, missed sights. We're going to hold each other accountable; and if you don't fall in that accountability, you get fined. "And so when [quarterback] Derek Carr walks in the room, he sees all the receivers -- this guy owes this, this guy owes this -- so everyone has that accountability factor. Because if everyone's held accountable, we've got to be at a certain standard. So I'm just here to set certain standards, hold guys accountable and just uplift the tradition of -- it's unacceptable to accept not our best. That's kind of my attitude. We're still shaping the team. I can't do it all in one day, but just as a first start, to kick off me being here and us doing some positive things moving forward." Brown is also in a unique situation in that he will play one season in Oakland, so long as the Coliseum Commission votes to approve the lease on Friday, before moving to Las Vegas in 2020. "For me to be in Oakland, part of the Oakland Raiders, and being on the last team that will ever be here in Oakland is something special in itself," he said. "There's pressure in that, there's excitement in that and there's a lot that comes with that. And I'm here today ready to embrace all that." Asked if he had any regrets on how he handled things at the end in Pittsburgh, Brown focused on young fans. "To any kid out there from Pittsburgh, Pittsburgh will always be my family," Brown said. "Those guys gave me a chance when I was a 21-year-old kid. Obviously, people are listening to the things that are being said and written. At the end of the day, it's all about how you make people feel. I think I made people feel good and great, really inspired, the way they watched me work, the way they watched me play. I know Steeler Nation is having a bad day today, but it's always love. I encourage every kid who watched me work and was inspired by everything I've done. I hope I continue to be a good example, continue to be a good role model and continue to inspire people." "My goal really is to catch Jerry Rice," Brown said. "Playing with a guy like Coach Gruden, obviously, he knows what it takes to keep me upright and fresh. Keep me out there for a long time so it's a challenge every year to prove my love for the game. I'm just taking it one year at a time. 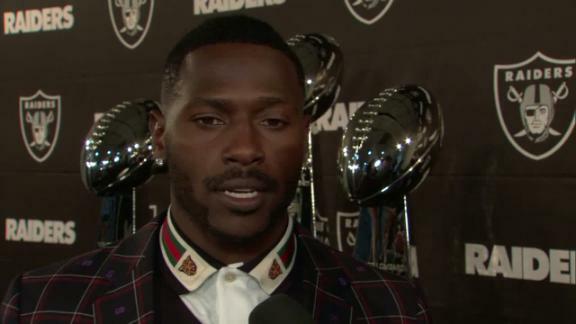 Antonio Brown discusses having to prove his love for the game every year and reveals the goal in the back of his mind is to catch Jerry Rice. 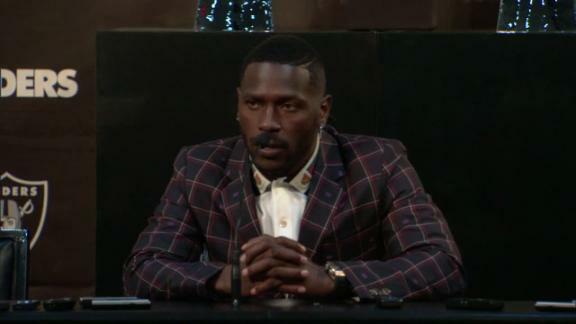 Antonio Brown praises the Raiders for welcoming him and his family. Brown also gives a message to young Steelers fans.